Adults can use the Schnozzle(R) too. Since adult noses are bigger, so are the results! The Schnozzle(R) was developed by a pediatric ER physician, and it worked so well on pediatric patients that many of the nurses, respiratory therapist and pediatricians working with the inventor started to use it themselves to relieve their own colds, allergic and sinusitis symptoms. They began to use it regularly on their own kids, grandkids, spouses and significant others with related issues. For many adults and older children that had already used other nasal irrigation products, like neti-pots and squeeze bottles, the Schnozzle(R) became their preferred go-to product. See what some of them said on our testimonial page. Of course, larger noses require larger volume syringes. Adults benefit from the Schnozzle’s more ergonomic delivery with better control of the pressure, volume and flow compared to traditional nasal irrigation devices. The Schnozzle(R) provides an effective and comfortable to control irrigation device that is easy to use: whether it is by an anxious first time rookie; as part of a daily health maintenance routine in the home bathroom or shower; in a hotel while traveling; and or in the workplace to stay productive. Get back on the road to recovery and feeling healthier. Create a seal with the nasal adapter. . Steadily push 30-60ml of fluid. For Children Under 12 see our other sections for recommendations. Its not just another Neti-Pot. Better control of fluid flow, volume and pressure. Distilled water and salt packets are available at your pharmacy and grocery stores. Distillation of the water helps to filter out bacteria and other microorganisms so you don’t add any potentially dangerous microorganisms up your nose. Only use appropriate volumes of fluid. See other areas of our website, for the recommended smaller volumes for babies and children. Using a syringe provides more precise control over the speed, volume and pressure of the fluid delivered than a neti-pot or squeeze bottle. Never force fluid into the nose. If there is any pain or resistance stop the procedure immediately. If you feel dizzy or lightheaded, stop the procedure immediately and sit in a chair or squat against a wall. Get back on the road to recovery and feel better along the way. Get relief from the stuffy nose that come with allergies. The Schnozzle(R) is an adapter that fits onto standard syringes designed to rinse debris or mucus from the nasal passages. Some refer to it as a being like neti pot. Is it a spray or mist? How much fluid do you use for an adult? For adults, use a syringe with 30 or 60 ml of sterile saline. Lean the head forward over a sink. Insert the Schnozzle™ into a nostril and push fluid. Repeat on other side. Similar to other products that are used to for clearing the nasal passages, such as a neti pot and saline mist, the Schnozzle™ adapter is not provided sterile. What is a Schnozzle ? 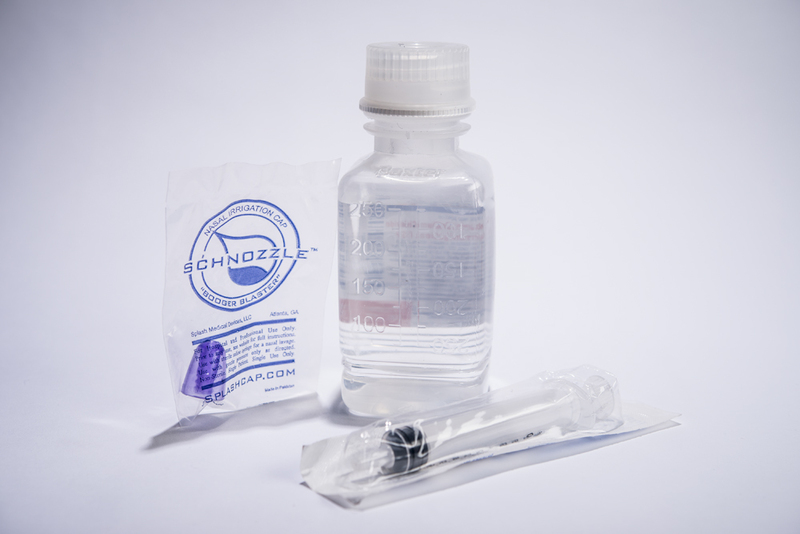 The Schnozzle™ is an adapter that fits onto standard syringes and is designed to rinse debris or mucus from the nasal passages. Can I use the Schnozzle on my child? You can use the larger syringe on bigger kids, but you need to use a smaller syringe for babies. We recommend that you only use only the recommended amounts. Be sure to read the instruction for use (IFU) so you have the correct equipment and use the correct technique. Also read the IFU for instructions including contraindications. Can I use the Schnozzle on Myself? Yes, see IFU for instructions including contraindications. After inserting the Schnozzle™ into the nose, push a continuous flow of saline through at a steady rate over about 3-5 seconds. If you encounter resistance, stop. Do not force. Also, do not push small amounts of fluid intermittently as this is more likely to cause gagging. The goal is to flush the nasal cavity. What size syringe do you use for an adult? 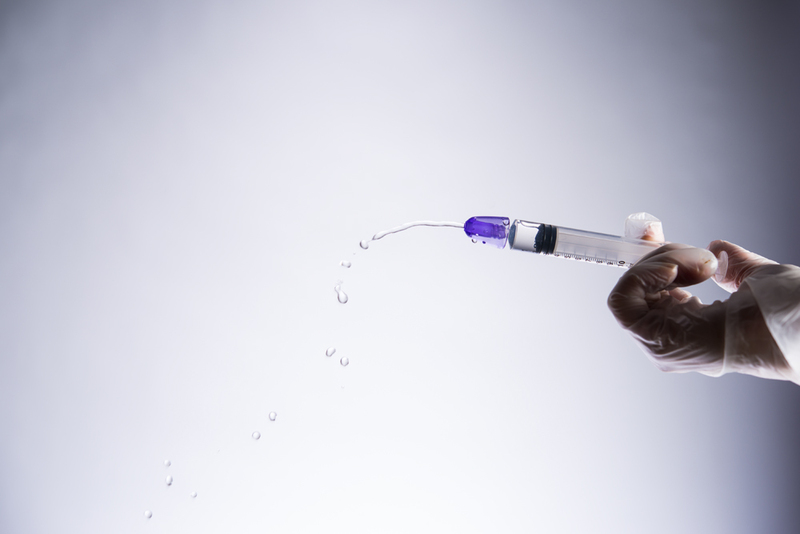 Adults use a 30 or 60 ml sterile saline syringe. How much volume do you use for an adult? While flushing just once is very helpful, flushing both sides helps insure the best clearance of the residual mucus and debris that may have been loosened with the first flush. You can also repeat irrigation on both sides for better clearance. The fluid passes thru the nasal passages, around the back of the nasal septum, crossing through the nasopharynx, and then continues clearing nasal passages on the opposite side, before exiting the opposite nostril. Your doctor can prescribe sterile saline bottles for purchase at any pharmacy. You can also use distilled water or water that has be previously boiled. Do not use in patients with craniofacial abnormalities, imbalance sensitivities, impaired airway protection or vasovagal sensitivity without clearance from your medical provider. What if I am using the Schnozzle™ and encounter resistance pushing the syringe? Nasal irrigation is already widely recommended and widely used with other over the counter products such as neti-pots. By comparison, the Schnozzle only uses small amounts of fluid that is limited by the volume of a syringe. 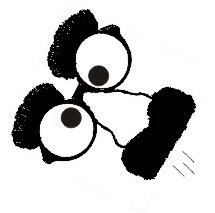 Furthermore, the fluid passes from one side of the nose and exits the other. The normal airway reflexes close the soft palate and protect the vocal cords and trachea from the mucus present before irrigation. Likewise these same mechanisms work to protect the airway during irrigation. The Schnozzle™ does not hurt. For some it feels a bit uncomfortable at first, like getting water from the swimming pool in your nose. If you experience this sensation, blow your nose after use. Releasing the mucus and fluid will alleviate symptoms. Yes, the Schnozzle™ is disposable. Single patient/single use only. Use it once only and then dispose of it safely. Can you administer medication with it? The Schnozzle™ is indicated for nasal irrigation of fluids to the nose.